Annisa is on the menswear inspired bandwagon with this two-piece look that could be described as “borrowed from the boys!” When doing the fittings for the photo’s I discovered this Anne Klein II pants suit on the racks of the store, and thought she could bring the requisite attitude to the look. Annisa is a teenage fashionista that really knows how to pull her style together! I suggested we layer on the necklaces, one from the Retique, one from Annisa herself, and one from Pam, a member of the Goodwill marketing department. Instead of a traditional blouse, we went with a gold infused scarf to soften the hard lines of the suit. We also added some gold pumps with rose detailing from Bertini, and a pair of my sunglasses. A cool pulled-together look that could be a fun for an evening out at the school dance or wherever she wants to take it! Look at Goodwill for menswear inspired suits and blazers for your own take on this popular look. Devion is a guy with a lot of charm and charisma. And, he also knows a thing or two about fashion himself! 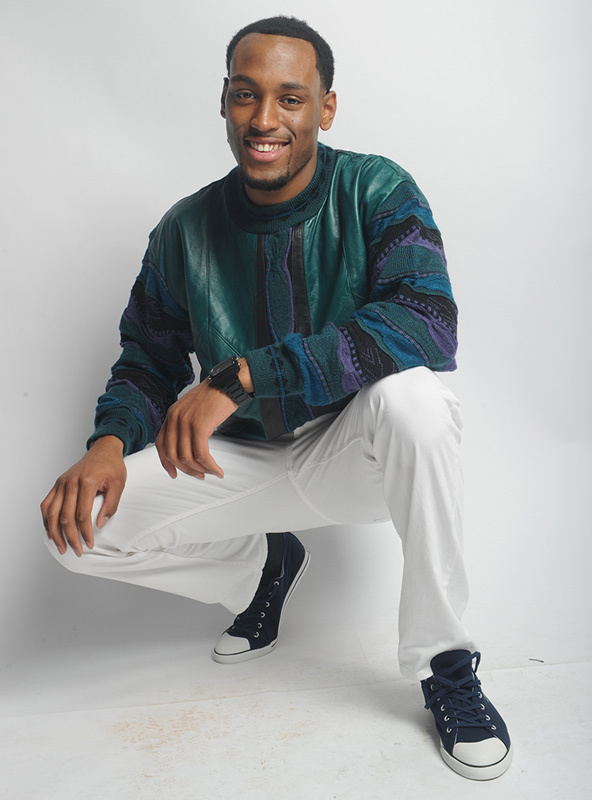 When I spied this Saxony sweater with teal-green leather details, I was reminded of Cliff Huxtable from the Cosby Show. But, only in a good way of course! How do you tame a wild sweater like this? You pair it with some jeans. In this case some H.I.S. white jeans, which by the way can be worn year round. The days of “no white after Labor Day” are long behind us. As long as the fabric is weather appropriate, in this case heavy denim, why not wear it year round? He added some of his own cool accessories like an Adidas watch and some Lacoste navy and white sneakers that really put a fashionable spin on these sporty pieces. Like I always say, relatable pieces are what makes for great style statements!